There are men, among which I include myself, who during their whole childhood used to ask for a fishing rod and a reel as a birthday present. Even today, as grown-ups, deep in their hearts, they still wish for the same present. And there is one question that most of them have asked themselves once: What is fishing? The answer, which always seems not explanatory enough, remains the same: a fascinating world invented by men, only understood by those who are part of it. The rest of the people do not understand our passion and fanaticism. An angler is a kind of man who is still marveled at the feeling of not knowing what lies beneath the water, whether in the sea or in a river, a lake or a small stream. And although time goes by and less and less things can still surprise us, this is a feeling that remains untouched among the thousands of anglers that every weekend approach any water mirror in the country to see what is kept under their waters. 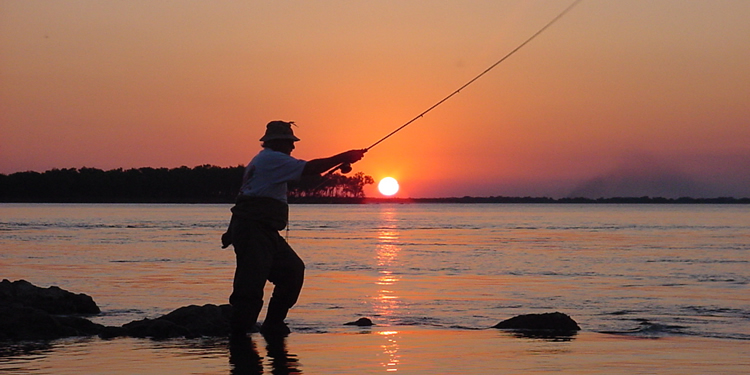 An angler is a romantic who is in love with nature. Some assert that one is born an angler, and it is true. But I have also met men who have been turned into anglers by life. And they are also very good. Fishing has managed to maintain its spirit intact from its origins. In a world where technology and science explain everything and disenchant the mysteries of the world, fishing religiously remains a secret. Before scheduling a fishing outing, every angler must take into account the seasons and, obviously, the species that can be caught during each of them. The summer is the best season for fishing. During the warmest months of the year, most species are active, and this happens in various environments all through the country. It is the ideal moment to go to Patagonia in search for trout and salmon. The wolf fish and the mullets become the stars in the rivers, streams and lagoons of the Province of Buenos Aires. Undoubtedly, at this time of the year, the sea is the ideal site to catch most species, among which the corvinas, soles and sharks are predominant.